A recently published book by a high-impact public health advocate provides new analysis on the use of flexibilities in international trade law relating to intellectual property rights aimed at advancing discussions on solutions to high drug prices worldwide. 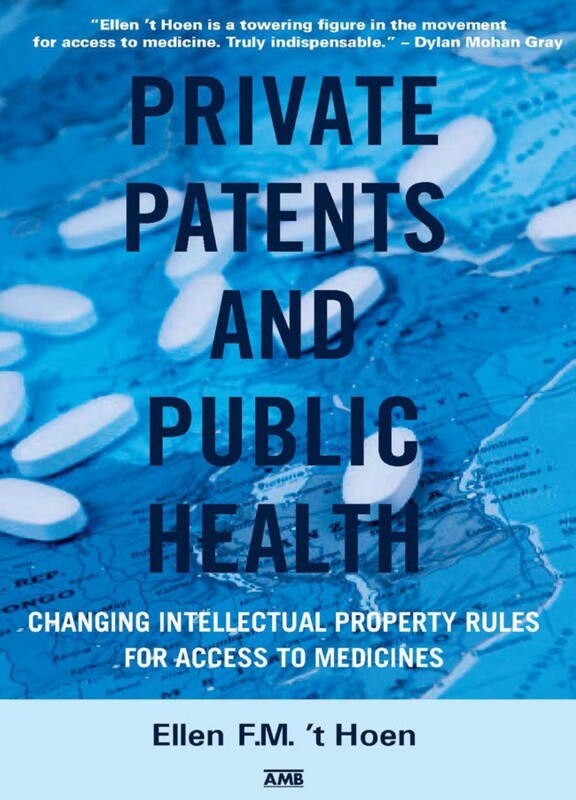 “Private Patents and Public Health: Changing intellectual property rules for access to medicines” by Ellen ’t Hoen, an authoritative public health advocate who previously led the global Médecins Sans Frontières (MSF, Doctors Without Borders) Access to Essential Medicines Campaign, and the Medicines Patent Pool. Ellen ‘t Hoen is a member of the World Health Organization Expert Advisory Panel on Drug Policies and Management, and a researcher at the University Medical Centre at the University of Groningen, Netherlands. The book provides information about the use of a range of flexibilities in the area of pharmaceuticals since the adoption of the 2001 World Trade Organization Doha Declaration on Trade-Related Aspects of Intellectual Property Rights (TRIPS) and Public Health. The WTO TRIPS Agreement went into effect in 1995. It also looks at trade agreements, human rights, and offers a thought-provoking look to the future, including a detailed analysis of the high prices of for cancer, hepatitis C and other diseases that are stirring debate in economies of all sizes. And the book concludes with chapters devoted to the need to fix the “broken” research and development system in which high drug prices bear little relevance to the cost of R&D, which itself is an unknown. The book lays out arguments for delinkage of R&D costs and pricing, and for an R&D agreement aimed at addressing problems of access while recognizing the need to encourage innovation. The flexibilities analysed in the book include a variety of instances of compulsory licences granted by a government or government authority, and a variety of uses of the LDC pharmaceutical waiver (paragraph 7 mechanism) in the context of procurement/importation. The book includes a table (and explanations) showing 34 instances of compulsory licensing in 24 countries for reasons of access to treatments, between the years 2001 and 2014. Of these, 20 were for HIV/AIDS, two for anthrax, two for avian influenza, two for cancer, one for migraine headaches, one for prostate enlargement, one for erectile dysfunction, and one for infection. Of the 34 instances, three involved developed countries, 26 involved 18 different developing countries, and three involved LDCs. And of the 34, eight were not executed and one is still pending. Further, the book shows 51 instances of government use licences during 2001 to 2014, only one of which was not executed. Of the total, 46 were for HIV/AIDS-related medicines. A third area the book documents is the use of the Doha Declaration Paragraph 7 mechanism of 2002. There were 32 instances from 24 LDCs invoking their rights under Paragraph 7. That paragraph in 2002 exempted until 2016 WTO least-developed countries (LDCs) from grant or enforcing patents on pharmaceutical products, or to protect test data. Last year, this waiver was extended to 2033. Finally, the book shows a chart of the use of TRIPS flexibilities from 2001 to 2014, exhibiting a sharp rise from 2004 to 2007, mainly for HIV products for which funding had become available. By the time use of flexibilities tapers off in 2008, “companies had begun to change their approach and implemented non-assert strategies for LDCs and sub-Saharan African countries and started to grant licences to generic producers,” the book explains. But middle-income countries still struggle to access lower-cost antiretroviral medicines as “they are often not able to benefit from licences and external funding sources,” it said. The book also noted a rise in 2014, the latest year for which statistics were available, in compulsory licenses for non-communicable diseases (NCDs, like cancer or heart disease), which could be a trend. “The focus of the use of TRIPS/Doha flexibilities may shift to NCDs now that medicines patenting is a global phenomenon and prices of newly patented essential medicines remain high,” ‘t Hoen writes. The book is written the way ‘t Hoen gives speeches, in clear, straightforward style, telling a story and making arguments in a way that does not dwell on academic or historical minutiae but rather makes key points to keep the conversation flowing. She succinctly walks through the WTO Doha Declaration on TRIPS and Public Health, highlighting key elements of the agreement that reinforced the primacy of governments’ right to act to protect public health (regardless of intellectual property rights). ‘t Hoen tells the story of the language agreed for paragraph 6 of the declaration, which was intended to help countries export medicines made under compulsory licence to countries lacking the ability to make their own. The paragraph 6 solution, which is nearing sufficient ratifications to become the first amendment to TRIPS, has only been used once, and she supports a revision of the language. But she also highlights another facet of paragraph 6 that holds potential for use in the future: the regional waiver, under which a least-developed country may import or produce generic versions of any medicine produced in its territory, both for its own needs and for export within a trade community to which it belongs if at least half of the community’s members are LDCs too. The focus of the book – such as on the paragraph 7 solution rather than paragraph 6 – could have the effect of shifting the focus of policymakers. A related website on access to medicines has been established by Health Action International based on the book. Ordering information for the book is here. "New Book Highlights IP Trade Law Flexibilities For Public Health" by Intellectual Property Watch is licensed under a Creative Commons Attribution-NonCommercial-ShareAlike 4.0 International License.